Florida ranks as the fourth highest state in the number of endemics, species that are limited to a particular geographic area. Only California, Hawaii and Texas have more unique species than The Sunshine State. Early botanists exploring Florida such as Alvan Wentworth Chapman(1809-1899) and John Kunkel Small(1869-1938) noted the high number of endemic species in the state. The geographic isolation of the Florida peninsula, climate and soil variations contribute to this unique biodiversity. Isolation during previous interglacial periods when higher sea levels created islands in the higher areas is also a likely factor that contributed to the high number of endemics. Scrubland Goldenaster, a species discovered in Highlands County by John Kunkel Small in 1924. During my years of exploring and capturing images of nature, I have had a particular interest in finding and photographing the rare species, many of which are threatened or endangered. As I learned more about these subjects, I realized that many of them are endemic to Florida. About five years ago I decided to work on a photography project focusing on Florida endemics, which I call Only in Florida. Applecactus Flower, photographed at night along the Mosquito Lagoon near the northern limit of this species' range. Twenty-one of my photographs of plants and animals unique to Florida are now on display through next February in a solo exhibition at the Lyonia Gallery titled Only in Florida. Other photographers with previous exhibits in the Lyonia Gallery include Lee Dunkel, Eric Breitenbach, Rick Lang, Beate Bass, Eric Dusenbery and more. Bigflower Pawpaw, photographed in the Lyonia Preserve, Deltona. The Lyonia Gallery is part of the Lyonia Environmental Center(LEC). Originated as a joint venture with The Southeast Museum of Photography at Daytona State College, the gallery is now operated by the LEC. 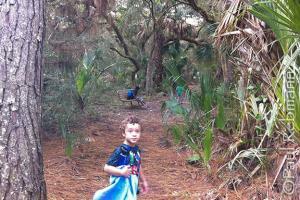 The Lyonia Environmental Center is located next to the Deltona Public Library and at the entrance to the Lyonia Preserve, a 360 acre Volusia County property managed to restore and maintain the natural scrub habitat. Lyonia Preserve is home to a population of Florida's only endemic bird, the Florida Scrub Jay. Florida Scrub Jay in an area of Lyonia Preserve undergoing restoration. In association with the Only in Florida exhibit, I have developed a program of the same name that will show the photographs from the exhibit and more. I will talk about each image, with information both about the subjects and how I made some of the photographs. This program will be presented at the Florida Wildflower Festival April 2 in Deltona, the Florida Native Plant Society state conference May 21 in Daytona Beach and on August 18 at the first Lunch 'n Learn at Ormond Beach's new Environmental Discovery Center in Central Park. Bartram's Ixia, discovered by and named for William Bartram. For an online preview of the exhibit and to learn more about the endemic subjects, visit the Only in Florida exhibit page at Wild Florida Photo. Many of you have heard that outdoor retailer REI has announced that they will close their stores on Black Friday and pay their employees encouraging them to spend the day outdoors in a campaign called #OptOutside. At least one other outdoor sports retailer - NRS - has followed suit. Being out enjoying nature is such a better way to spend the day after Thanksgiving than the hustle and bustle of the annual shopping ritual, which I cannot remember ever participating in and if I did it was a very long time ago. Virginia & I have spent most of the past Black Fridays camped in a state park for the long weekend, often with friends and family. We are not camping this Thanksgiving weekend, but we had a very special camping trip the previous weekend at Anastasia State Park. It was our first time camping with children, taking three boys on their first campout. These boys, aged 10, 6 & 4, were relatives whose family recently moved to Florida and were very enthusiastic about going camping and on a nature hike. A torrential downpour cancelled our walk on the beach, but it did not dampen the adventure. Our endeavor to follow the advice of Richard Louv author of Last Child in the Woods and other books on children and nature seemed a success as our young camping guests seemed to have a fun time outdoors and unplugged. A great blog on enjoying the outdoors with youngsters is The Big Outside by Michael Lanza where there are stories about outdoor adventures, tips for backpacking with children and gear reviews. In my years of photographing wildflowers I have found that Florida State Forests provide some of the best locations to locate interesting subjects. The 37 state forests in Florida comprise over a million acres of land. The forest service manages these properties for resource management, to protect biological diversity and for various public uses such as hunting, hiking, bicycling and horseback riding, just to name a few. Many of the hiking and horse trails are featured in the Trailwalker and Trailtrotter programs that encourage keeping track of the trails completed to earn small tokens of accomplishment. I have hiked over 20 of these trails, attaining the Trailwalker and Trailblazer levels. The Florida Trail also passes through some of the state forests, and many of the forests are part of the Great Florida Birding Trail. The natural habitats in forests throughout the state allow native, and sometimes rare, wildflowers to thrive. This is especially true when the appropriate fire management can be conducted, which the forest service strives for as resources and conditions allow. One of my favorite locations is Tiger Bay State Forest, which is home to a substantial portion of the known populations of the rare Rugel's false pawpaw. Deeringothamnus rugelii is endemic to Volusia County, meaning this is the only place it naturally occurs. Also called yellow squirrel-banana, this little plant responds well to fire, not liking the competition from other plants after too many years without fire. Other subjects I have photographed at Tiger Bay include Pine Lily and Pines and Milkweed Veins, a close up image of a pinewoods milkweed leaf. Butterflies abound as well, including Zebra Longwings and a Phaon crescent butterfly in Phaon on Phyla. The tiny little flowers are turkey tangle fogfruit (Phyla nodiflora), a host plant for this and several other butterflies. The Florida Indian Plantain,also called Florida Cacalia and subject of the photo titled Florida Cacalia Trio is another Florida endemic wildflower that I photographed both in Tiger Bay and Lake Wales Ridge state forests. Clasping Warea, an endangered endemic wildflower was photographed in the Warea Tract of Seminole State Forest. Goethe State Forest, where I captured this crab spider on a rayless sunflower, is also home to many native terrestrial orchids. The horned bladderworts at Okaloachoochee Slough State Forest reminded me of little yellow conquistador helmets, which I photographed from various angles. 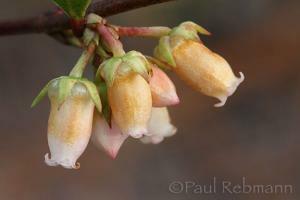 The fetterbush flowers at the beginning of this post were found at Point Washington State Forest in the panhandle. There is much to experience in our state forests and I encourage anyone who enjoys nature and the outdoors to check one out. Regular readers may remember my post earlier this year on hiking a section of the Appalachian Trail last December. Daniel and I returned for another section hike at the beginning of March and he posted a 13 minute video overview of this second wintery hike on youtube. The monthly Nature Photography by Paul Rebmann newsletter has notifications of new blog posts, events and special sale offers. Subscribe here. Florida's Ocklawaha River flows north 74 miles from Lake Harris in Lake County passing through Marion County and along the western border of the Ocala national Forest, ending in Putnam County, entering the St. Johns River just upstream of Welaka. The Ocklawaha is the largest tributary of the St. Johns River, and Silver River is the largest tributary of the Ockalwaha. The 5-1/2 mile Silver River is the outflow of Silver Springs, one of Florida's largest freshwater springs. The name is derived from ak-lowahe, meaning muddy in the Creek language. After the earlier Timucua people of this area were vanquished by disease and early colonists, Creeks moved in as they were pushed out of their traditional homelands to the north. Those native peoples that remained in Florida came to be known as Seminoles. The Ocklawaha River was one of Florida's earliest tourist attractions after the Civil War, with specially designed steamboats taking passengers along a wild jungle cruise up the Ocklawaha to Silver Springs. This activity peaked in the 1870's and diminished after railroad service was established to Ocala in 1881. The Ocklawaha was intended to be a major part of the cross Florida barge canal, a project started several times and canceled in the early 1970's but not before Rodman dam was built, creating a reservoir out of part of the river. For a complete history of the canal, one should read Ditch of Dreams: The Cross Florida Barge Canal and the Struggle for Florida's Future by Steven Noll and David Tegeder. The path of the canal is now the Marjorie Harris Carr Cross Florida Greenway, named for one of the people most active in the efforts to stop the canal from being built. The July-August 2012 issue of Audubon Magazine featured an article by Ted Williams about the Ocklawaha River titled "Has One Florida Dam's Day Finally Come?". Recommended reading for anyone who would like to know more about this beautiful river and the struggle to remove a remnant dam from the abandoned cross-Florida canal project. The sections of the Ocklawaha that are still natural are some of the most scenic waterways in Florida and make for excellent canoeing and kayaking. The river is enjoyed by many, including paddlers, birders, fishermen and others. It is a favorite of both myself & Virginia, and we like to be on this beautiful river as often as possible. 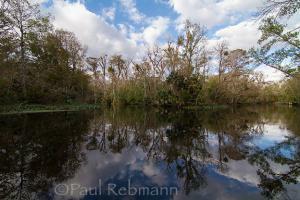 All of the photographs in this blog post were made along the Ocklawaha River. Each year since 2001 the non-profit organization Operation Migration has used ultralight aircraft to lead that year's juvenile whooping cranes from the breeding grounds in Wisconsin to Florida for the winter. After being shown the migration route once, the cranes head north on their own in the spring and return to Florida each succeeding winter. In the winter of 2010-2011 I planned on going to one of the public flyover events and was all set to see the whoopers when they came through Marion County in December on their way to Chassahowitzka National Wildlife Refuge. Weather kept the ultralights & cranes in north Florida where they waited until after the holidays, and then resumed the final leg of their flight in January. 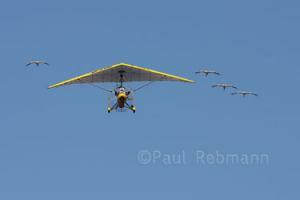 This photograph of four of the whooping cranes and the ultralight aircraft are from the flyover event in Marion County just before the cranes arrived at their last stop. The other half of this flock wintered at St. Marks National Wildlife Refuge. More photos from the flyover event can be seen at Wild Florida Photo and information about of whooping cranes and other photos of these birds can be seen on the Wild Florida Photo Grus americana page. To learn more about the work and history of Operation Migration visit the Operation Migration website. One of the highlights of the local Ormond Scenic Loop and Trail is the Fairchild Oak, a majestic live oak tree estimated to be over 400 years old. This tree is located in Florida's Bulow Creek State Park and was named for botanist Dr. David Fairchild who was fond of and visited the tree regularly in the early 1900s. This is the same Fairchild that Fairchild Tropical Botanic Gardens in Coral Gables, Florida is named after. Capt. 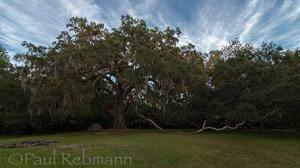 James Ormond's 19th century Damietta plantation, just north of present day Ormond Beach, included this landmark oak tree. Live oaks range through all the southeastern coastal states from Texas to Virginia and are found throughout most of Florida except for the keys. 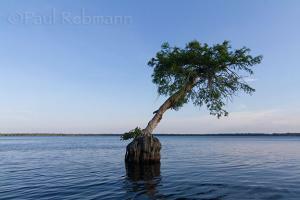 For more information and photographs of live oaks visit the Wild Florida Photo Quercus virginiana page. It was early March when I heard about a local bird rescue. My friend David Hartgrove, an expert birder and active leader in the local Audubon Society had been notified about a great horned owlet that had fallen out of a tree before it was ready to fledge. Having access to a cherry-picker from the local power company, he placed the owlet back in the tree with its siblings. Surprisingly, the owl parents had selected as a nest tree a tall longleaf pine tree in a vacant lot near the intersection of two main roads near the center of town. To top it off, it was now bike week, an event that brings several hundred thousand motorcycle enthusiasts to the area. I had only seen a great horned owl once. That was in Hillsborough River State Park when my wife and I were heading back to the car as dusk was approaching. That owl was perched on a branch ahead of us along the trail and we stopped to admire it as long as we could as the mosquitoes were just coming out for their evening feeding and we were on the menu. Since I had not photographed one of these majestic birds I now had to take advantage of this opportunity. After work I went to the location and sure enough, there were owls in the tree. At first I only saw one of the adults, but I eventually spotted three young owls and the other adult. With the rumble of Harleys passing nearby I was able to get some photos of both adults and owlets in the late afternoon light. I returned the next morning for some more shots. The image of the adult owl appearing to be staring right at me stood out from the rest and gave me the impression that if it could it would say "Don't Mess With My Chicks". 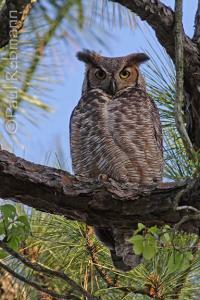 For information about Great Horned Owls and more photos visit my Wild Florida Photo website. After communicating only virtually up until then I finally met Florida children's book author Christopher Tozier in person when we both attended the fifth annual Florida Scrub Jay Festival at Lyonia Environmental Center & Preserve. Christopher Tozier is the author of Olivia Brophie and the Pearl of Tagelus, the award-winning, middle-grade fantasy series set in the wilds of central Florida and published by Pineapple Press. He was selected as a 2011 State of Florida Artist Fellowship and he has followed up with another book, Olivia Brophie and the Sky Island. 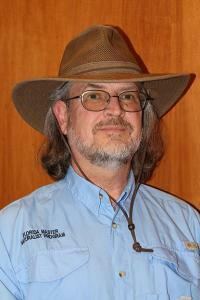 Christopher also blogs regularly, in which he often mentions interesting items regarding Florida nature, especially of the scrub habitat. I was interviewed by Christopher for his blog, which can be read at www.christophertozier.com/2014/02/an-interview-with-award-winning-florida.html to learn a little more about me.